The subcutaneous Bile Collection System comprises two ClearPort Vascular Access Ports - for connection to the balloon/occluding catheter and the sampling catheter and a T-Tube catheter which is placed in the common bile duct. The T-tube is a specialized silicone catheter with 2 arms - the sampling and occluding catheters. 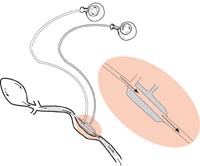 Once connected, the balloon catheter can be occluded for the total, quantative fluid collection without any exteriorized components. Custom sizes are available. The system is low pressure, has no exteriorized components, provides quantative fluid collection, accommodates long-term use of animals, provides selective infusion, enables convenient fluid sampling and allows unrestricted animal movement. Biccs Operation; the bile duct is cannulated and the catheters are inserted into the bile duct. The sampling catheter should be on the liver side of the balloon. The sampling and occluding catheters are tunneled to the subcutaneous port sites for connection to the Vascular Access Ports. For Bile Collection; insert the Huber Needle sampling set into the sampling Vascular Access Port. With the balloon in the unoccluded/open position, bile will not flow through the sampling catheter. Occlude the balloon by infusing a hypertonic glucose solution into the Vascular Access Port attached to the balloon/occluding catheter. The balloon in the T-tube will inflate closing off bile flow through the T-tube. The bile is diverted into the sampling Vascular Access Port for collection through the sampling right angle set. When collection is completed, the sampling right angle set is removed. The fluid in the balloon Vascular Access Port is removed with a Huber Needle and Syringe, restoring bile flow to the duodenum. Also available are Bile Collection Systems with the T-Tube catheter system: BAD catheters. These 100cc resilient, all silicone reservoirs provide constant, effective, gentle, positive suction drainage and permit accurate measurement and analysis of the drainage fluid. Reverse flow is prohibited due to the anti-reflux valve. Available in single units in a sterile Tyvek pouch.